YES! More Marjorie! Capitol Theater this sunday at 9:30. FREE! The Answering Furrow 1985, 16mm, 27 min w/assistance from Hollis Melton and Helene Kaplan. We will be watching three shorts by Marjorie Keller on Thursday November 26th @ 11:30 pm. @ OFS. Screening at OFS at NOON on Saturday May 2nd. Be there! Bring your friends. Let's hang out and talk about the film afterwards. 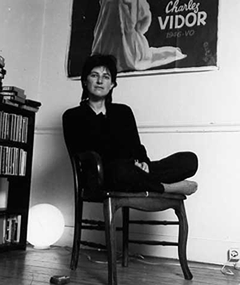 Chantal Akerman Thursday April 9th @ 11:45 pm sharp! Je, tu, il, elle plays on Thursay April 2nd @ Midnight. Chantal Akerman directed and plays the lead in this early (1974) black-and-white feature that charts three successive stages of its heroine's love life. the camera starts out in this film motionless, grounded, almost like it's deeply rooted in the side walk or the floor of the subway. the audience is forced to consider one perspective, one shot, for maybe the length that you wait for a bus or a train. In this time you sit and feel and think about your surroundings, a mammoth city, full of large dark buildings and strangers in every shade of the human race. The loneliness of new york has never been so real on film. "News from Home" does not tell you of the loneliness, it is the loneliness. Watching the film I thought about my ex-roommate Edie who moved to NY last fall to study political economics. She was paralyzed by her loneliness at times, growing up in the small town of Carnation WA and having left a tightly knit group of friends and family here in olympia, new york was an overwhelming place to try and find community as a newbie, even for a graduate student. There are different reasons people leave home, to learn to grow, to know more then what their "home" can teach them, to escape from others or try and escape from ones self. I thought about all this as I watched "News from Home". We learn about Chantal's move to the big apple through letters her mother compulsively mails her. Chantal reads them to us. It seems her mother is coping with the vast distance between her and her daughter, writing letters possibly every other day. Watching this film I thought about my own mother and our relationship. It gave me room to think about me and my mom, and to relate Chantal's experience to my own. What an important subject to create personal space for an audience to explore. I also appreciated the pedestrian means of the production of the film. A tripod, a sub way pass, and a taxi ride are her modes of carrying the audience through her true NY experience. Accessible, unpretentious, and moody.